Be on your guard, by all means, but don’t panic. 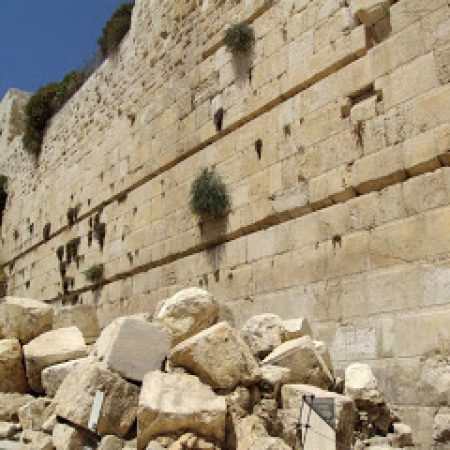 When Luke recorded these words from Jesus, his readers were reeling from the destruction of the majestic Jerusalem Temple and much of the city by the Romans. The events were so shocking and earth-shattering, that many began announcing the imminent end of the world. But Luke repeats the words of Jesus: Don’t be led astray by the doomsday prophets who are always trying to read everything as a sign of what God is going to do next. Many will come saying “This is it.” “The time is near.” “He is the one.” “It’s a sign.” Do not go after them. In the year 410, when Rome fell to the Visigoths, many, both Christians and pagans, were sure it was a sign of something big happening in the heavens, and Christians were again looking to these apocalyptic passages of scripture, and thinking that the world was about to end. In 2001, we heard this same reading from Luke’s gospel just two months after the earth-shattering 9/11 attacks in the USA. Again it seemed that the symbolic centre of the world had been brought crashing down. There were wars and rumours of wars; there was a great surge of destructive nationalism, and speculations were rife that the end was nigh. And today we hear these words again, days after the election of Donald Trump, capping a year that also saw the election of the similarly unpredictable and frightening President Duterte in the Philippines, and the Brexit vote fracturing the European Union. Many will come saying “This is it.” “The time is near.” “He is the one.” “The abomination of desolation.” “It’s a sign.” Do not go after them. Don’t panic! Jesus is not, however, saying that we shouldn’t worry about these events. He is not saying that they don’t matter and that we can ignore them. But he is saying that we shouldn’t waste our time or energy trying to interpret them as signs of something beyond themselves. These things are to be taken seriously as intensely human events, not trawled over to see if they can be squeezed into some interpretation of biblical prophesy. The right response is to recognise them as signs of who we are and what we are doing to ourselves, not what God is doing. These events are intensely and thoroughly human. God is not orchestrating the rise of divisive nationalism or resentful hostility. God is, as always, to be found among the first victims of such outbreaks. Those who embody love and mercy most fully are always the first to be crucified when aroused mobs are looking for their next victim. So we are not to fall for panicked predictions that God is about to destroy the world, but neither are we to be complacent and think that the threats aren’t real. Those who unify their support base by inciting frenzies of rage against the vulnerable will create conditions in which being a faithful ambassador of the culture of Jesus will be a risky business. As Jesus went on to say in the reading we heard, “But before it is over, they will arrest you and persecute you; they will hand you over to synagogues and prisons, and you will be brought before kings and governors because of my name. … You will be betrayed even by parents and brothers, by relatives and friends; and they will put some of you to death. You will be hated by all because of my name.” There is no room for complacency. And perhaps the events of this week are another stark reminder that living in a prosperous western democracy gives us no reason to imagine that a rising tide of us-and-them violence won’t turn on those who stand firm for open-bordered hospitality and the merciful love of enemies. Even if you are still feeling safe and complacent, we have one among us tonight, one who we love and have journeyed with for some time, who is about to go and live in another country where being a follower of Jesus is officially seen as a suspicious and subversive threat to the state and the national culture. Unlike anything most of us have ever faced, finding and settling into a new church will need to be done on the quiet, lest career prospects or even family safety be imperilled. Being baptised into that new church will not be something that can be celebrated with joyous accounts and photos on Facebook for all to see. Celebrated yes, but not recklessly publicised. It would be too risky. And my point is not that such a situation is unusual. On the contrary, in global perspective and according to the witness of the Bible, such a situation is actually quite normal. This is why the symbolism and language of baptism speaks so clearly of being put to death. You don’t really understand the meaning of your baptism unless you grasp what a risky thing it is for so many others. Perhaps that awareness is a gift that is being left with us tonight. The thing that is unusual is our capacity to feel complacent, as though following Jesus were no more controversial or risky than being a keen gardener. And given that both the USA and the Philippines are countries where the overwhelming majority of voters identify themselves as Christian, you have to wonder how far we Christians have sold out the unambiguous teachings of Jesus in order to be able to even imagine voting as we have done. When angry resentful mobs are determined to identify vulnerable enemies to vent their fury on, those who stand in solidarity with the crucified will not remain safe for long. The end may not be nigh, but the dangers are real, and the challenges of uncompromising faithfulness to the ways of Jesus are not to be taken lightly. Jesus does promise that “not a hair of your head will perish, and by your endurance you will gain your souls,” but he says that immediately after saying that “they will put some of you to death” so he is not promising that you won’t get hurt. The road to life and love without limit goes by the way of the cross. The words of Jesus, and the beloved friend we are about to farewell, and the news of global chaos all remind us that “the way of the cross” is a lot more than a harmless metaphor. But so is the promise of life and love without limit. Thank you Nathan for a practical, realistic and down-to earth sermon – based on an interpretation of the Gospel reading. Great sermon Nathan. Like many people, I have been incredibly dismayed & confused by the election of Trump as US President. I can so easily get stuck in dismay, so your sermon was genuinely helpful. Another beautiful Sunday worship gathering. Thank you.